The DSM ESC from Jeti is dual input redundant electronic switch designed to operate with included magnetic key. The advantage of an electronic switch is that it offers a virtual unlimited ON/OFF cycles, unlike mechanically operated switches. The redundant DSM ESC switch automatically monitors and switches between two power supplies (Two Rx Batteries, Rx Battery & ESC or Two ESC's) keeping your system operational. 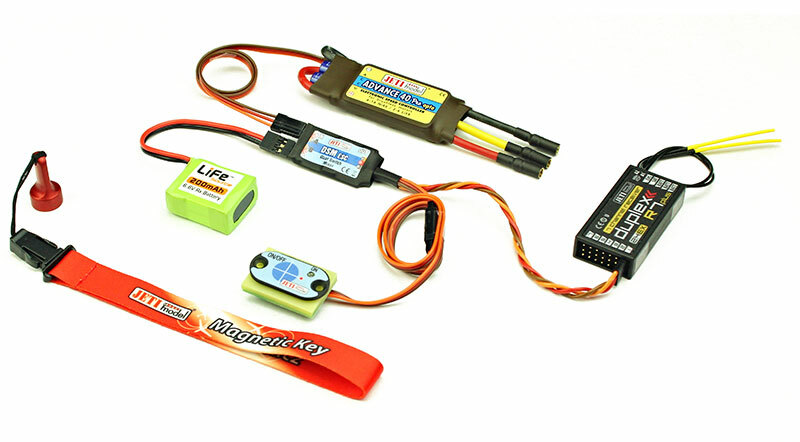 In a case of using two ESC's the throttle signal from the receiver is supplied to both controllers simultaneously. Final solution in redundancy and reliability from Jeti is here. The DSM ESC is designed for two independent 5-13V inputs (Battery & ESC or 2x ESCs) and supports up to 10A continuous current or 20A burst current for your connected devices. This unit is most suitable for today's high-voltage servos, which you might be operating directly from a two-cell LiFe battery or similar Li-Poly battery pack. Please note that DSM ESC does not include a regulator, output voltage is equal to input voltage.